This week’s Friday Follow Twitter Interview is coming to you live and sort of late from Singapore. It must still be Friday on the American continents. I have been here in Singapore conducting a heap of workshops and working with educators from all areas of the teaching and learning spectrum. Tonight I am out with my friends with our quarterly MacMeetup which always coincides with my visit and this Friday our very special guest is Sivasothi, an incredble teacher, researcher, biologist and Mac addict. He also loves his cats. I have been friends with Siva for more than ten years now and for me Siva is Singapore. He is an incredible man and is a font of great wisdom. Siva and I are hanging out with friends here in Singapore. There are photographs of our meetup here on Siva’s Flickr page. We have been on so many adventures together: knee deep in mud, up to our necks in waters carrying camera equipment above our heads, cycling in the tropical heat on tropical islands, all night steamboat dinners, looking for horseshoe crabs in the mud by dragging our butts along in the mud, collecting mangrove snakes for tagging, drinking coffee, having a great time. Siva is a social media in education legend and if you explore his blogs and sites you will see he was actively using social media with his students even before the term social media existed. Siva is the social media in education pioneer and I guarantee you will not find an earlier performer of the art in education circles. 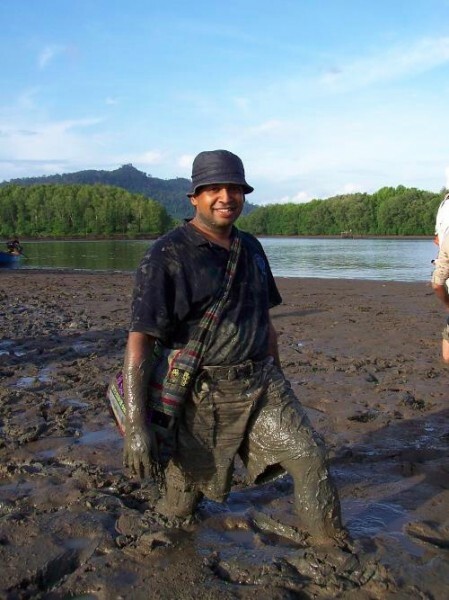 I teach biodiversity, ecology, animal behaviour and zoology at the National University of Singapore and have been involved in natural history work as an educator, researcher and conservationist for over two decades. I earned my moniker “Otterman” in the 90’s when I worked on them intensively and love the mangroves, my second home. I work with students on research on a variety of species in various habitats which include mudskippers, mangrove and freshwater crabs, wild boar, mouse deer, common palm civets, monitor lizards, red jungle fowl and of course otters. I’m the national coordinator of the International Coastal Clean here in Singapore and am an avid mac user, enjoy cycling and a story-teller! I am still fascinated by the opportunity blogs have provided in sharing our thoughts, having experienced the process of generating a print student magazine in the 80’s. So I setup blogs for the various topics I am engaged in. Even if just amongst friends, there is value in the expression. Blogging has diminished these days, so I make students blog a post in some classes, e.g. the 2011 animal behaviour class. Besides communicating science (they are encouraged to share those stories with friends and family) in these one-off exercises, the process allows them to appreciate the detail and effort of the process and joy of the outcome. I am still evaluating how and if Twitter and Facebook can contribute. The use of the latter is inevitable as two-way communication there is more productive and spontaneous there for many students. I am still in awe of the dramatic change we have experienced over the past two decades. As it was with mailing lists of the past, I pick out the constructive communities, spaces or conversations and exposure and education are the lovely outcomes. Facebook has enabled me to extend shared time with friends, which is very relaxing during the bus ride after a busy day or between tasks. We encourage and motivate each other – most of us are trying to save the planet some way! it’s widespread use and ease of sharing means the news feed can be helpful in my line of work – some grad students grabbed a blood sample of a rare primate after I alerted them to its death from a friend’s facebook post. While Facebook has promoted conversations, it has made everything ephemeral. It’s near impossible to find an old conversation and the valuable insights it may have produced. So if you’re still blogging, rock on! Still, real life conversations take precedence and I dedicate time and attention to those above platforms. And whilst engaged, I toss aside my smart phone or mac. In my classes, I promote ‘old school’ technology – face to face conversation between peers. Having them effectively engage randomised group mates (subgroups of 4 in groups of 12) in some depth has enhanced their feeling of belonging within a large class (100-200 students) and improved teaching, learning and communication. I communicate effectively most of the time, am objective, open to ideas, listen, integrate and adapt. Actively encourage the content generators, they are the minority amongst us who carry the web – thank someone whose photo you used by telling them how you used it, drop a comment on a blog post that helped you find a solution or provoked a thought, “like” a friend’s comment on facebook if it brought a smile to your lips, holler the occasional “yea!” to that entertaining and informative twittering friend of yours. I do this as much as I can and these special individuals are stimulated to do more! Be kind. Radiate good vibrations. What would you include in a science communication class? I have been interested in the idea of a small-sized module (?40 undergraduates) I’d like to offer to the communicative, content-providing minority who provide for and stimulate the rest. ? That’s Siva with David Attenborough by the way. “Actively encourage the content generators, they are the minority amongst us” So true Siva. The web is the perfect medium of unique voices, yet it all too often gets lost in the noise of retweets and the like. Thanks for putting up this enlightening profile John.